Using all ourknowledge and experience, we’ve created James Wellbeloved Light Fish Adult. We take a handful of ingredients from nature, one source of animal protein and combine them with all the vitamins and minerals your cat needs. And all the great taste it deserves. For added peace of mind, it’s naturally hypoallergenic so less likely to cause an adverse food reaction, made without cereals such as rice and barley for those more sensitive dogs and you will never see any added artificial colours, flavours or preservatives. Not now, not ever. to promote weight loss whilst maintaining muscle. My cat loves it. And I'm happy with the low fat version as we need to keep his weight down. 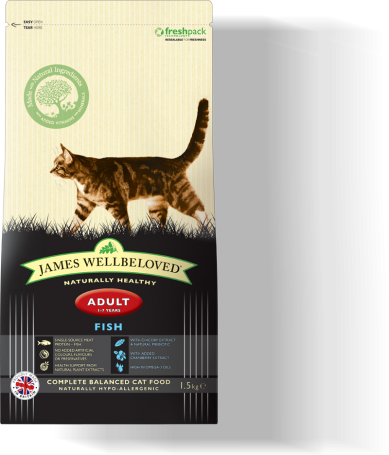 He is very fussy with most cat food but there's never any waste with James Wellbeloved. My cats love this fish flavour in favour of the turkey. Excellent food for both of my cats. I would not feed them on any other brand of food. 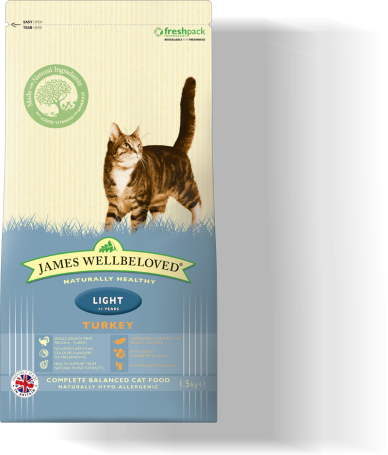 My cat Gizmo has been raised on James Wellbeloved biscuits, he loves them and he is looking very good for an 11 year old.